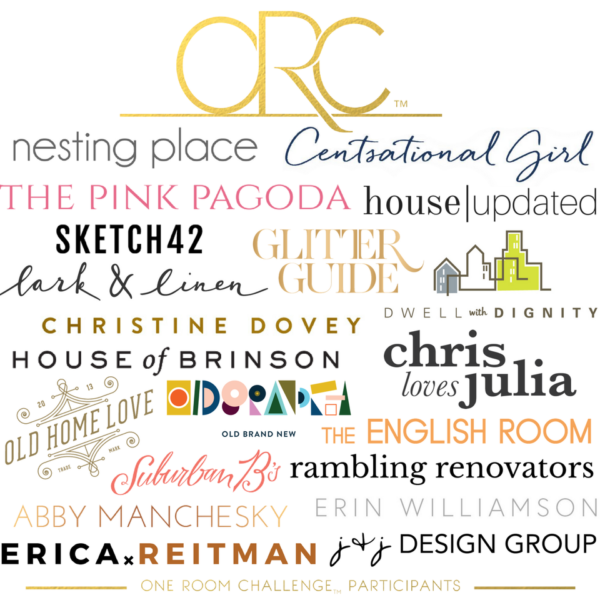 I’m so happy to get to share that I’m joining the One Room Challenge (ORC) this year! I’ve been keeping up with the ORC for years and have thought about joining in as a guest, but this time around Linda invited me to be one of the featured bloggers and we’ve all had to keep it a secret. A quick about me if you’re new: my name is Myquillyn (like Jacquline but with a “mike”). I’ve been married to Chad for 22 years, we have three teenage boys and three years ago we moved out to the country to a fixer upper on 12 acres. I’ve been blogging here for almost 10 years, I wrote a book all about embracing imperfection in your home, my style is ultra-casual and thrift-store-apporachable and I absolutely ADORE this online community of Imperfectionists and Cozy Minimalists. I think the internet is a wonder and a gift and also, isn’t Netflix the best invention ever?! About the One Room Challenge:: The ORC is a six week challenge (in its 11th season!) created by Linda from Calling it Home in media partnership with House Beautiful. 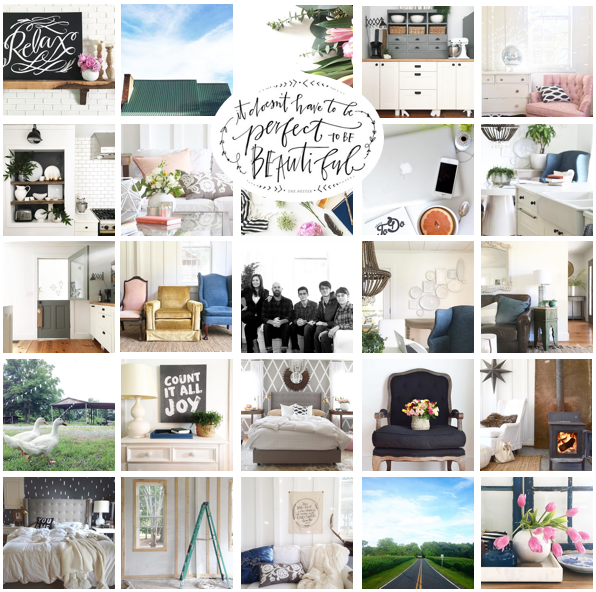 Twice a year Linda invites 20 bloggers/designers to transform a room in their house from start to finish and share all the details online within a six week timeline. There are some great sponsors who also join in the fun which allows for the participants to be even more creative in the details and the pieces that they incorporate. It’s an honor and truthfully, super intimidating to join in this project. Some of my favorite designers have created some of my favorite spaces during this six week challenge in the past. The creativity and inspiration are full on, y’all. I hope I represent us, the Imperfectionists and Cozy Minimalists, well. The room I’ll be transforming and sharing over the next 6 weeks is…. The weirdest, most awkward room in our house. I begged myself to be normal and redo our family room or a bedroom but I KNEW in my heart I needed to tackle this tricky space that is the bane of my existence. This room is a glorified porch addition to the back of our house. 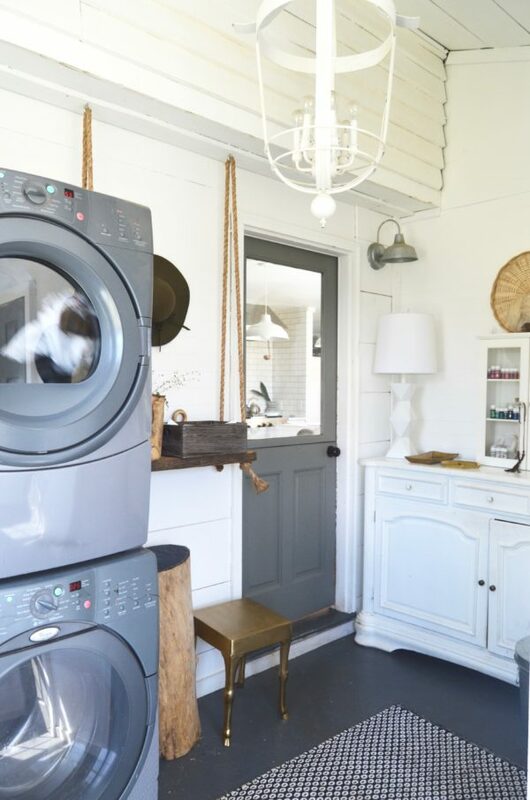 It’s multifunctional–part laundry room, part guest bath, part coat storage, part junk room, part entryway. Yep, the worst part of this room is because of the way our driveway is currently set up, all our guests come to our back door and this is the very first room they step into. This back porch serves as a front entry. Nothing says welcome like a shelf full of cleaning supplies. Living in a fixer upper for the past three years, I’ve learned how to make some rooms decent enough where I wouldn’t lose my mind, without spending any money or much time. That’s what I did with this room while we focused on the kitchen and bathrooms and ceilings in the rest of the house. This room has been a temporary fix and knowing when and how to use a temporary fix can be really helpful to our sanity. But you also have to know when a temporary fix has run its course. All that lovely wood, right?! It actually was lovely–it’s 12 inch pine that was harvested by the man who built this house, there was a sawmill on the property here (we’re outside Charlotte, NC) and he milled all the wood himself right outside that back door. 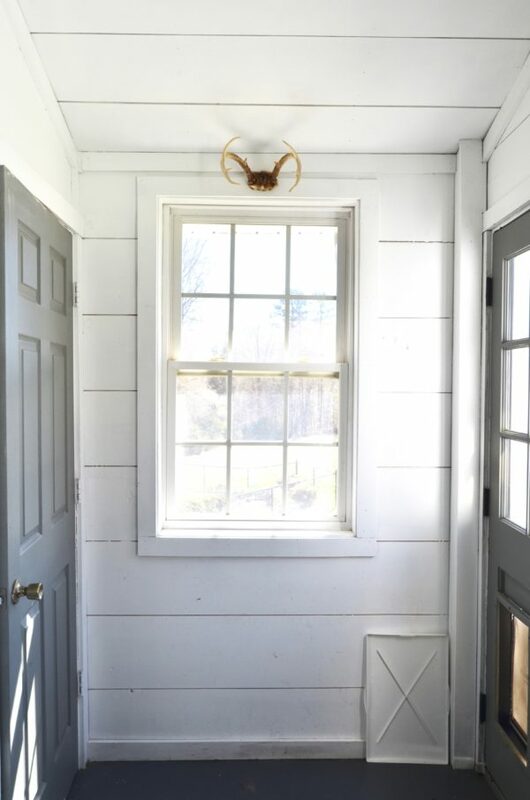 When we moved in, the entire downstairs had this same 12 inch pine on the floors except for the kitchen, so we sacrificed some of the wood on the walls in this back porch and removed it and installed it on the kitchen floor. We replaced the planking, but since we couldn’t match the wood plus, the room was super dark, we painted it all white. 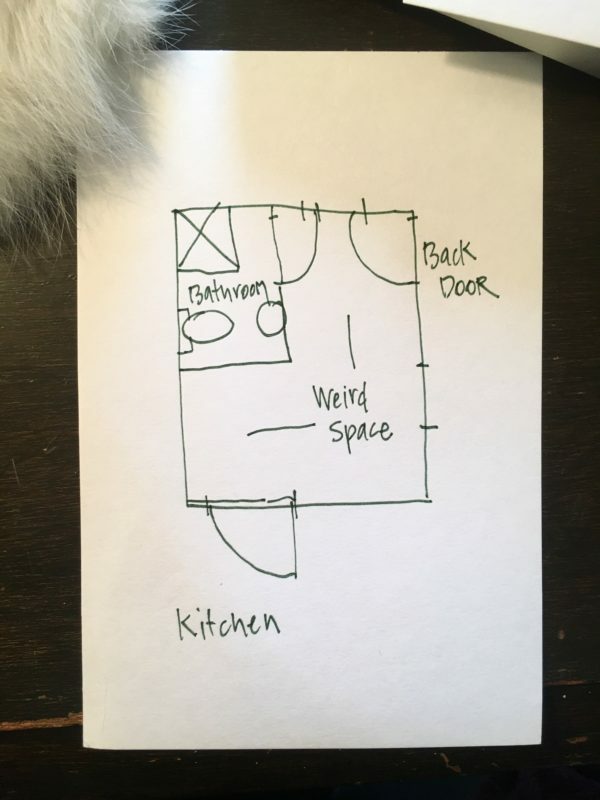 Here’s my not to scale overhead drawing of the entire space–it’s a rectangle space but with the bathroom in the corner the main part of the room is L shaped. 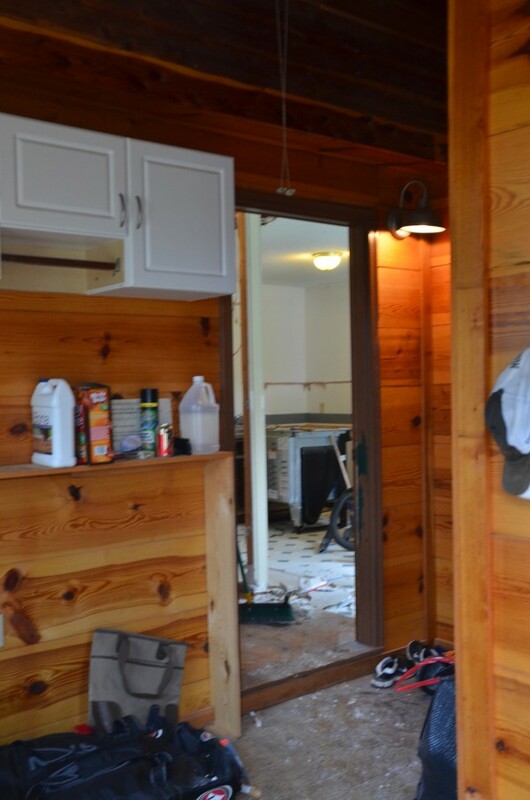 But don’t worry, we still have a lot of wood around, there’s also a bathroom back here and it’s all cedar! We haven’t touched this bathroom since we moved in, it’s the last one in the house to get any attention and does it ever need it–and y’all this is the bathroom all our guests have to use! Dear every guest we’ve had in the past 3.5 years, I’m so sorry. 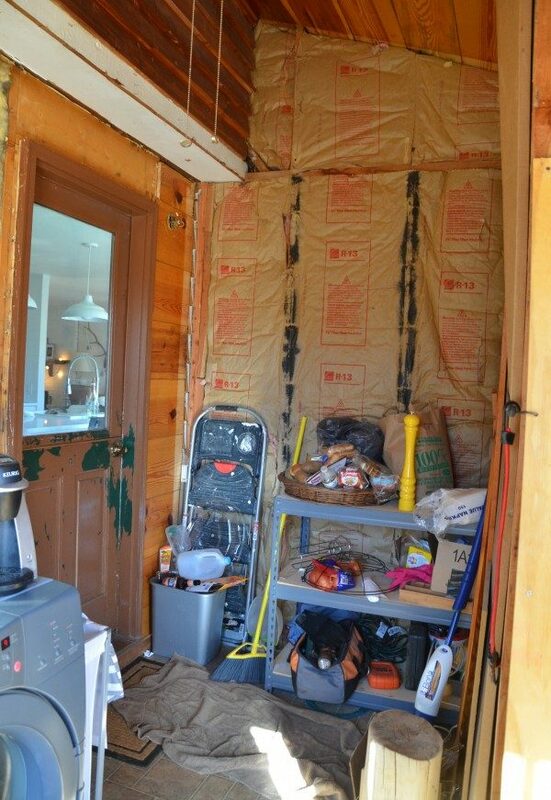 We’ll be keeping this room simple and no worries, those cedar walls aren’t going anywhere. And here’s a little glimpse of the direction I’m headed, I’ll share the full design board next week. Want to keep in touch and not have to exert so much precious energy clicking over here every Wednesday for the next 6 weeks to follow along with this room’s progress? I’ll make it so easy–just sign up below and I promise to keep you posted, plus, you’ll have instant access to the Furniture Shopping Guide. You’re the absolute best! Congrats on your new project! And for bringing imperfection into the spotlight! Can’t wait to see the finished product! ? I love that you’re tackling a challenging space…they always make for the best reveals and I’m so excited to follow your makeover along!!! it will be awesome! love the artwork and can’t wait to see it come together. Can’t wait to see how it all comes together, I know it’ll look amazing when done! 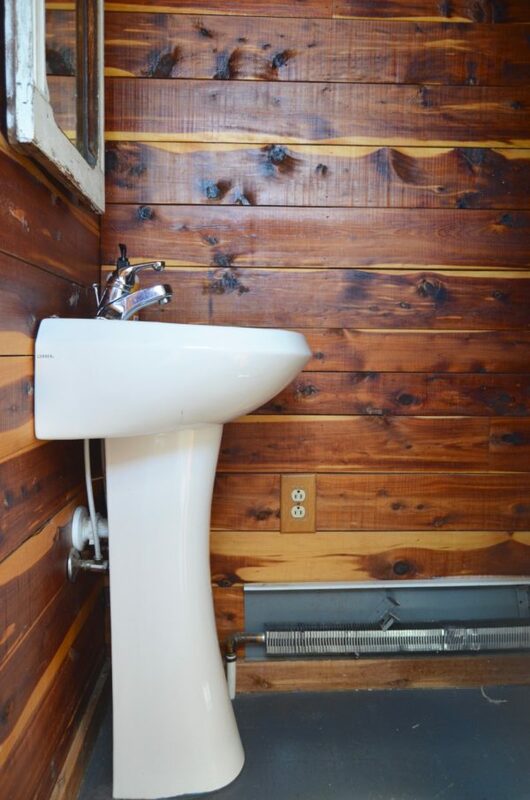 Oh, I love those bathroom cedar walls…glad they aren’t going anywhere. Happy to be joining you on this journey even though I hate travel, too!!! Wow Myquillyn! Who in the world would have know we have nearly the exact room that is the Bane of the home! LOL! 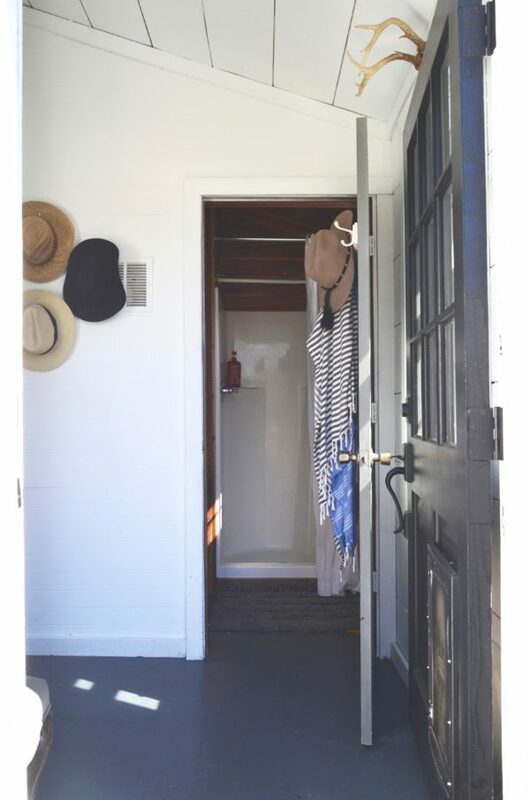 Mine is similar without the bathroom immenities my Laundry room turn (PLEASE OH PLEASE) into the WELCOME ROOM! has the laundry also a sink with counter and all the cabinetry! Our sweet puppy (our test baby,Prior to our 4 kiddos) tore apart the vinyl flooring and years later we finally replaced with a tile the color of Saltillo tile. I yearn to make it into a lovely garden room(thinking of Victorian/Practical Magic ) as it leads from the driveway to the back yard and also into the home…dining room/kitchen to be exact. I’d dig some faux painting maybe an old ralph Lauren stencil….anyway dreaming along with you maybe this will motivate me to get moving ahead…working on the huge declutter thing now….So excited for you and looking forward to your vision! Oh yay! I love ORC!!! Glad you get to participate! Gotta say I was impressed by your bounty of cleaning supplies! Can’t wait to see where you take this. hey girl- can’t wait to see the progress! Have fun! This will be a fun space to see transform. 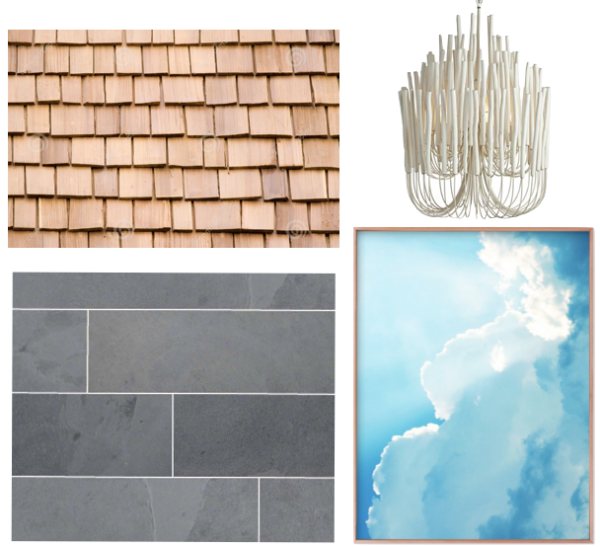 Love that chandelier and I’m so curious what you’re going to do with the cedar shingles! Love this! So excited to see your journey! I can’t wait to see what you do! 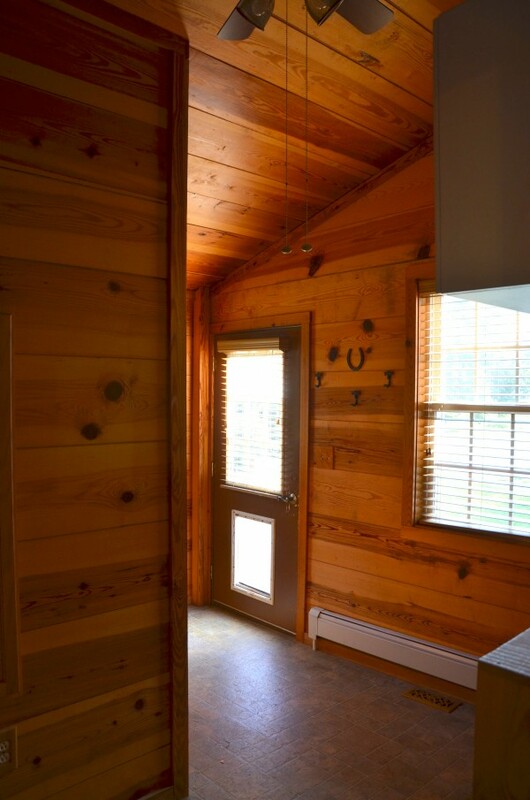 Our entrance is the back porch where sits the washer, dryer and hot water heater. You know it’s a farmhouse. Gotta lov’em. You have a little more room than us. And I love your style. I’m interested to see what you do. 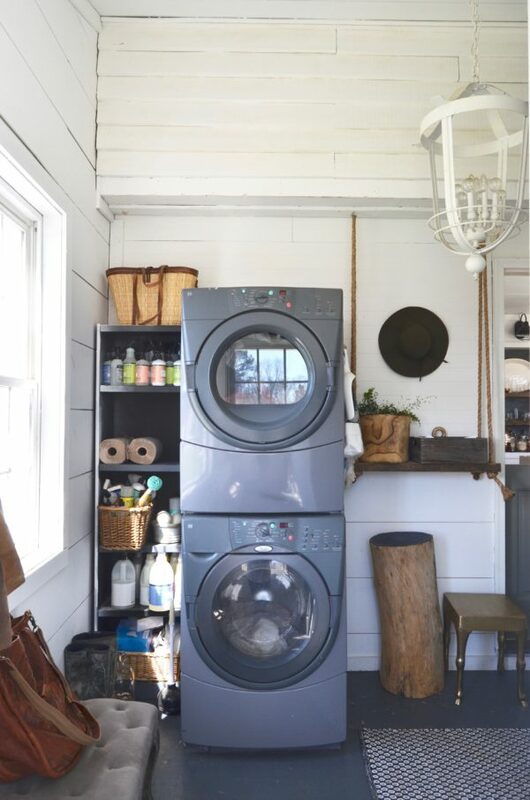 My backdoor/laundry room/entry because of the driveway are always cluttered and just aren’t very welcoming in my opinion. The chandelier is probably my most favorite of all time. Its on my list to have in my house some day! Can’t wait to see how you use it in your space! It’s so funny, I have always loved your stop gap on that room. But I can’t wait to see how you make it function better for your family and mesh better with the rest of your gracious home! 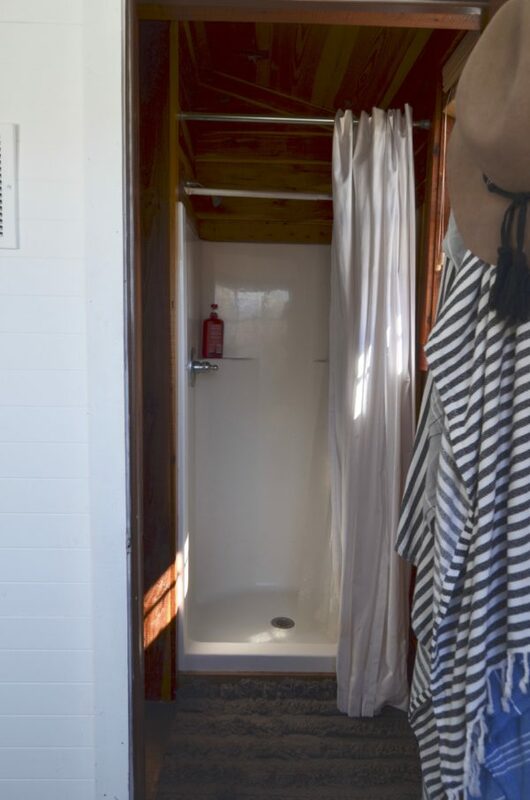 I think you need a barn door to the bathroom that just slides from the left just enough to cover the door opening. It would be less expensive than s pocket door and is great style. I know there are a lot of wood lovers who are happy to hear about the cedar staying. 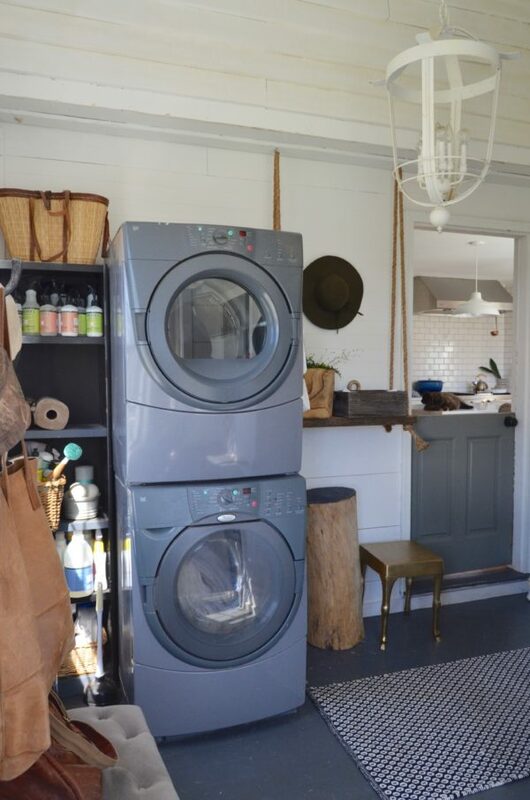 I like the painted walls in your laundry room. It’s not that bad, but it will be fab when you are done. Hi! I’m so excited to see this transformation! I wanted to let you know I tried to sign up for the updates twice and have not received my email confirmation. I checked all my folders including spam – nothing. Must be lost in cyberspace somewhere (maybe the moon?? ha!)! Wasn’t sure if I should keep trying, or if you know of a glitch? Thanks in advance for the help. Oh I am SOOOOOO excited to see your joining in for this ORC, and that we’re both tackling laundry spaces, though yours is certainly much more challenging. I can’t wait to see it unfold!!! I love what you’ve done with the space already! Can’t wait to see it all polished up. Hi Myquillyn. This is unrelated to your topic, but relevant to this post. Did you know that you have a bunch of “Save Save Save Save Save Save” at the end of your post? Your posts frequently have these. On your site it looks like empty space at the end of the post, but in Feedly, my RSS feed reader, it literally lists the word Save over and over at the end of the post. Here’s my guess for why this happens. Do you use WordPress? I do too, and I noticed that when I edit my posts in the rich text format, every time I make a change it adds “Save” to the bottom of the post… but I can only see it when I switch to plain text format. It doesn’t show up in the rich text format. If I only edit in plain text format it never puts the “Save” on there, though. Looks like it’s doing the same thing to you, only perhaps you haven’t noticed the “Save”s since you don’t switch format views. Your posts vary in how many “Save”s they have, and it’s probably related to how often you edited that post before publishing. I haven’t said anything before because it’s usually only 4 or 5 “Save”s, but this time there are 33 of them! It makes your post super long. I don’t know why WordPress does this or how to make it stop, except that when you’re finished, you can switch to plain text format and manually delete the list of “Save Save Save” and THEN publish/schedule the post. I love how you labelled your diagram “weird space” too funny. The chandelier is amazing! Can’t wait to see more. 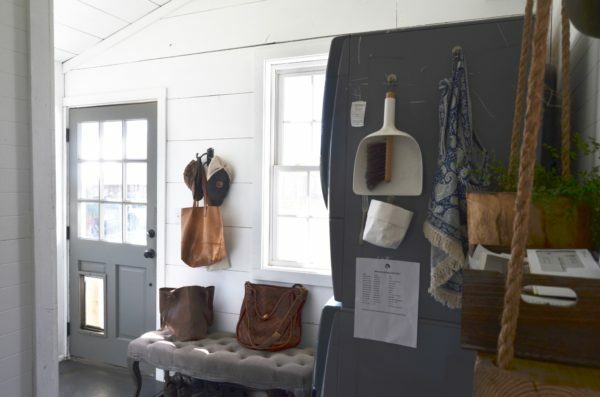 Will you be keeping anything in the new space? Love Love Love projects like this! Can’t wait to see the update. Congratulations! 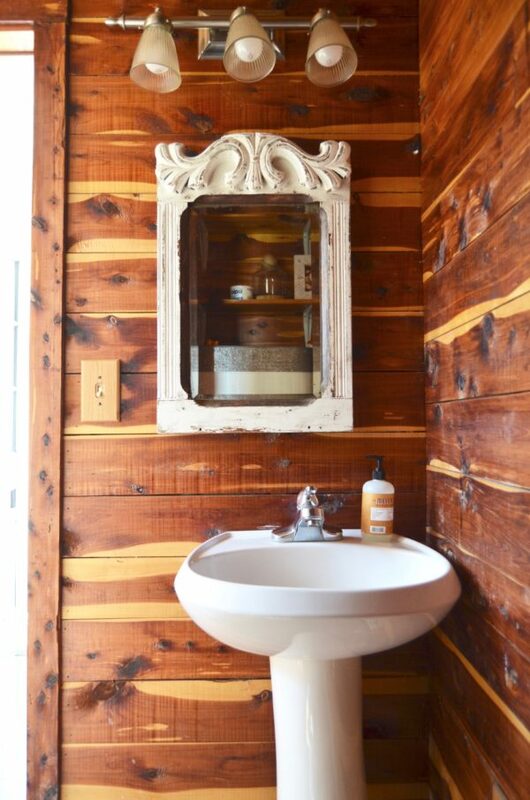 I am drooling over those cedar walls, so glad you’re keeping them! I’m excited to see how you put this together :) I’m sure it will be beautiful!